Invasive plants such as Kudzu aren’t anything new in these mountains, but one in particular is especially disturbing. As I write this post, I have a mild case of Poison Ivy. Its a real inconvenience, but not much more than that. 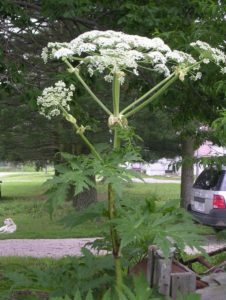 However, have you heard of the Giant Hogweed? Ask Alex Childress what he knows about it and it will frighten you. It makes Poison Ivy look like a mild case of athlete’s foot. Last week, the 17 year old was doing some landscaping when he cut a stalk of the plant and it brushed against his face and arms. That night he was in the hospital suffering from third degree burns. He was there for two days. Read the Charlotte Observer article here. (warning, the photos are shocking) The plant looks innocent enough. It grows up to twelve feet in height and its top fans out like a giant umbrella covered with small white flowers. It can thrive in the environment of our western North Carolina mountains. But the sap is toxic and is activated by UV light (sunlight). If it gets in the eyes, it can cause blindness. This is a seriously mean weed. Its still relatively new to North Carolina and has recently been spotted in Watauga County (Boone and Blowing Rock areas). However, one plant can produce about 20,000 seeds. Sounds as if its something we’re simply going to have to learn to live with. So if you’re out hiking our mountains or especially going through overgrown fields, there’s more than Poison Ivy and ticks to worry about. Watch out for the Giant Hogweed.